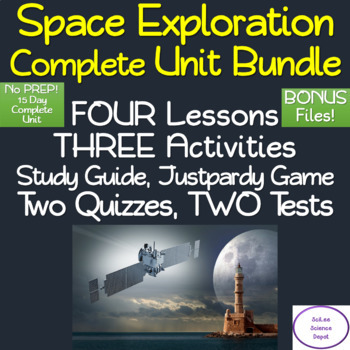 Space Exploration Unit Bundle: No Prep, Complete 15 Day Unit! 14 Five Minute Timed Daily Warm Up PowerPoints, 15 Day Unit Plan. The STEM: Space Exploration Unit Bundle includes FOUR separate lessons, each one including a PowerPoint, illustrated Student Guided Notes, Teacher Notes, and a Worksheet with Answers. In addition, there are THREE Activities, a Study Guide, a Justpardy Review Game PowerPoint, TWO Quizzes, and TWO Tests. PLUS a Bonus File. 14 Five minute timed daily warmup PowerPoints. The STEM: BBC's Space Race: Race for Satellites Video Reflection is an alternative way for students to actively watch a science video without having to spend time trying to answer specific questions. This assignment is a Video Reflection of the BBC’s Space Race: Race for Satellites. The video gives a good historical perspective of competition between the Soviet Union and the United States to be the first to put a satellite in orbit. The video reflection handout has two columns on it. Student write what they have learned on the column on the left. They write down any questions they have on the column to the right. At the end of class, each student needs to tell the teacher something they learned, or a question they have. The STEM: Cosmic Journeys- Solar Superstorms Video Reflection is an alternative way for students to actively watch a science video without having to spend time trying to answer specific questions. This assignment is a Video Reflection of the Cosmic Journeys- Solar Superstorms video. 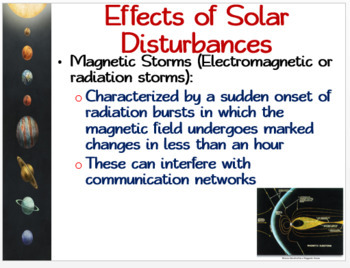 It explains the impact solar storms may have on Earth. The STEM: Unmanned Space Exploration Project allows the students to do independent research to make a multi-media presentation. They can use PowerPoint, Google Slides, or even Poster paper to complete the project. The STEM: Space Exploration Study Guide is two pages ling. 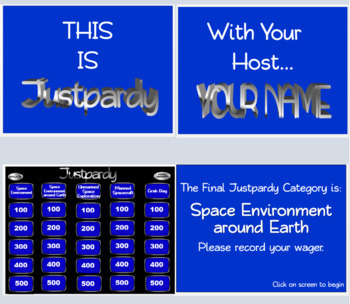 The front page has over 30 key Space Exploration Vocabulary Words that the students need to define. The second page has 9 open response type questions the students need to answer. 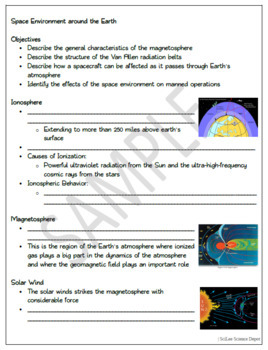 The Space Exploration Assessment Pack includes TWO Quizzes and TWO Tests. These both tie in with my other Space Exploration lessons that are available at my TpT Store. Thirty multiple choice type questions. Two open response type questions (students are instructed to answer one of the two). The Space Exploration Portfolio/Reflective Journal is an assessment tool where the STUDENT picks how they want to show you they have mastery of the subject. I give this type of assignment the very first day of the unit. It is my belief that the teacher needs to let the students know exactly what they are expected to know by the time the unit is over. This also gives them time to work on their project. This assignment can be an additional assessment for students or the main assessment used.